Drop the idea of buying chia pets during spring and decorating your home. Instead opt for handmade, ecofriendly chia pets to adorn your porch, window sill, or the center table in the living room. 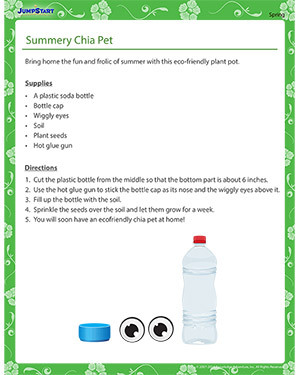 You will just need empty plastic soda bottles, their caps, some soil and seeds to convert the bottles into chia pets! Have fun with this spring craft.